Many factors contribute to the global distribution of Earth's oceans, but the strongest by far is the centrifugal force that results from our world spinning about its axis. This raises an interesting question: how might our planet's water be apportioned if the world gradually stopped spinning altogether, thereby removing this centrifugal effect? Equipped with spacial mapping software and a formidable working knowledge of Earth's geophysical intricacies, GIS analyst Witold Fraczek has provided a compelling answer to this thought experiment in a recent blog entry. The line that delineates the areas that hydrologically contribute to one or the other ocean would follow the equator if the earth was a perfect ellipsoid. 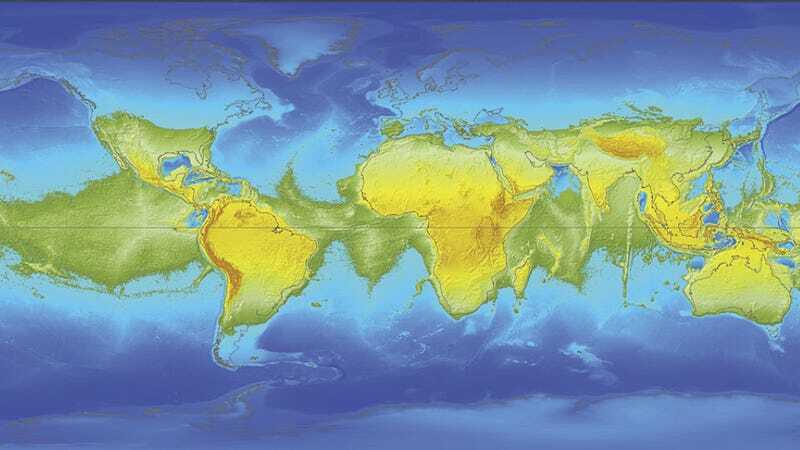 However, due to the significant relief of both the continents and the ocean floor, the hypothetical global divide between the areas that hydrologically contribute to one or another ocean deviates from the equator significantly. Analogous to the well-known U.S. Continental Divide, this would be the border separating two giant hemispherical watersheds of the new circumpolar oceans. Interestingly, the highest point on this global divide would not be the highest altitude on the entire globe. The highest elevation of the global divide in the Colombian Andes would be about 12,280 meters, whereas the altitudes of the famous equatorial volcanoes of Chimborazo (Ecuador) and Kilimanjaro (Tanzania) would be 13,615 and 12,786 meters, respectively. Both volcanoes happen not to be located on the global divide line. The lowest point on the new global dividing line, with an elevation of 2,760 meters, would be situated southwest of Kiribati Island in the western Pacific. Due to the unique relief of the earth's surface at the beginning of the slowdown, the most significant changes to the outline of land versus water would occur at the high latitudes of the northern hemisphere where the swell ocean would quickly expand over the flat and vast territories of northern Siberia and northern Canada. At the same time, changes to the continental outlines at low latitudes would be barely perceptible because (with a few exceptions) equatorial waters are deep, and a decrease in water level by a few dozen meters would not cause large areas of land to emerge. Toward the end of the slowdown period, when the main geographic features of oceans and land would have already adjusted to the ellipsoidal shape of the globe and the new distribution of gravity, relatively small changes would occur. This can be attributed to the ellipsoidal shape of the globe, which overwhelms the effect of the diversity of the earth's geographic relief. This is a relatively small excerpt from an exhaustive (and damn interesting) analysis on Fraczek's part. Head on over to Esri for the full breakdown, including several maps depicting intermittent stages of oceanic migration and changes in land extent.